Dubai, UAE – 08 October 2018: Imdaad, a Dubai-based group of companies that provides integrated and sustainable facilities management (FM) services that enhance operational efficiencies of physical assets, has successfully participated in the 2018 edition of FM Expo, the Middle East’s premier event for the FM industry, as a Strategic Content Partner. 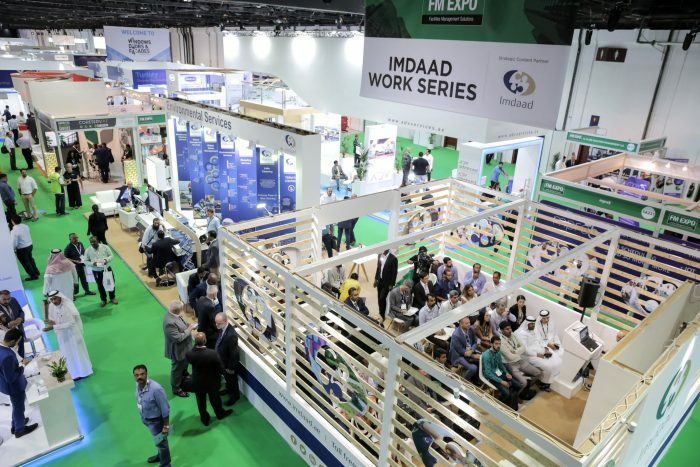 Reiterating its commitment to promoting the sustainable development of the industry, the company hosted the second edition of ‘Imdaad Work Series’ at the event held from 23-25 September at Dubai World Trade Centre. Showcasing the latest innovations, such as Computer Assisted FM (CAFM), exploring emerging trends in the industry, and discussing the future of energy management in the Middle East, Imdaad Work Series attracted experts, professionals, and businesses from across the diverse FM disciplines. Students from universities and schools in the UAE, including Dubai Technical College and Dubai International Academy, attended a workshop titled ‘Be’ati,’ as part of Imdaad’s program to teach the nation’s next generation the need for waste segregation and recycling as a vital component of environmental sustainability. The workshop, held as part of Imdaad Work Series, provided them with a deeper understanding of healthy waste and recycling practices. In addition, Imdaad showcased its comprehensive range of integrated facilities management solutions, which include Hard FM, Soft FM, as well as environmental services such as solid waste and wastewater management, at its stand at FM Expo. The company also highlighted its Isnaad division that offers manpower supply services, and Imtedaad, which provides real-time insights into the performance and trends of interconnected assets and ecosystems to offer recommendations for predictive maintenance and corrective actions. “We are pleased to have sponsored and participated at FM Expo 2018, which provided industry stakeholders with a platform to connect with their partners and customers, and exchange knowledge and ideas that will inform new solutions and services in the region’s thriving FM sector. Similarly, we are proud that the second edition of Imdaad Work Series at the event was a resounding success as it offered new insights that will contribute to greater efforts towards future-proofing the FM industry. In addition, we are glad we included our special Be’ati workshop this year, which plays an important role in educating college and school students about the importance of this industry,” Mr. Lootah added.